Colour: White wine (Riesling Spätlese). Nose: Fruity with citrus blossom, yellow fruits - apricots in particular, and a hint of toffee. Some spicy notes of ginger and white pepper in the back. Palate: Sweet and intense on the palate with vanilla and red peaches. Becomes spicier on the midpalate with white pepper, ginger and a whiff of oak. Notes of lemon and apricots linger with subtle caramel towards the finish. Finish: The finish shows medium length with orange peel, anise and slightly dry oak on the tail. With water: There's less fruitiness coming through when a few drops of water are added while the spiciness with pepper and ginger is dominating. Still sweet on the palate with oranges, followed by caramelised ginger and black pepper. The finish is medium to short with a warming mix of toffee, ginger, barley sugar and oak. Comments: A refreshing single malt from the Lowlands by Douglas Laing. Delicious citrus notes combine in harmony with ginger spices and a fine vanilla sweetness. Despite the 48.4% abv surprisingly powerful. If this is too much for you, you can dilute it with a few drops of water. The result remains sweet, spicy and fruity. 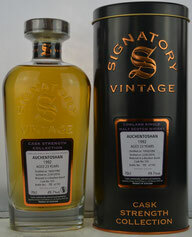 A thoroughly successful Auchentoshan! I thank Douglas Laing for the complimentary sample and the photograph! Nose: A sweet start on the nose with creamy vanilla, toffee and crème brûlée. Filigree fruitiness behind with lemon, subtle orange, and a hint of mango coming through. The alcohol is not yet fully integrated but stays discreet in the background accompanied by tender spiced oak. Palate: Strong on the palate with sweet vanilla, toffee and citric fruits - lemon and orange. This is complemented by a warming spiciness of pepper, ginger, and nutmeg. Clean and crisp with slightly dry oak towards the finish. Finish: The finish is long, warm, and sweet with lingering vanilla and dry oak on the tail. Nicely mouth-coating. With water: On the nose, water tames a bit of the filigree fruitiness bringing more oak to the fore. The alcohol is still very present. Strong and intense on the palate with a massive load of spices - oak, pepper, nutmeg and cloves. Less vanilla sweetness, less fruitiness but significantly dry with oaky tannins. The finish is a bit shorter. Dry oak dominates the creamy vanilla sweetness. Comments: A beautiful and delicate dram. 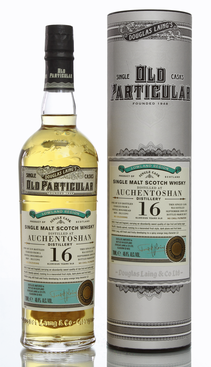 This Auchentoshan aged amazingly well. Multi-layered, with the lovely vanilla sweetness and filigree fruitiness being well balanced by the spiciness of the bourbon barrel. Clean, fresh, sweet and dry. Take your time with this, it deserves it. But, no water please! I thank Kirsch Whisky Import for the sample and the photograph!